From what I was able to see, behind the stand was what appeared to be an art-deco style statue in the shape of a face, and it kinda looked like this.. I believe it was a Gamestation magazine? Or maybe it was called Powerstation..
Has anyone else seen this possible beta object from the same magazine? did you get a special copy or something? Who releases help guide with wrong stuff? This information could have ruined one's attempt to do this mission. God knows..it's happened before though..? Cool clips to see in case somebody missed them. 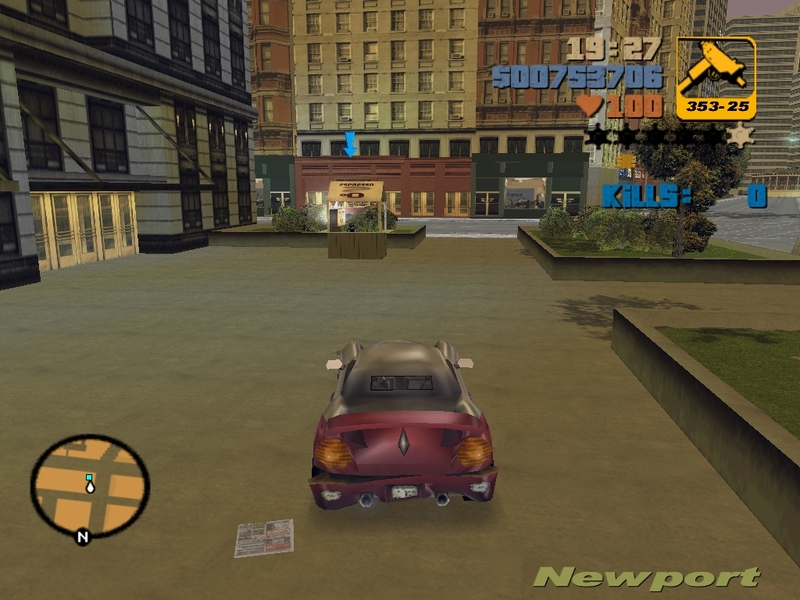 Based on the source code of the script file, there are many variables for parked cars that were not used in the game. They could probably have existed in the pre-release but have been removed from the final version. That Coach bus is still there in final game, albeit in a different parking space. Just a minor coordinate change. About "gen_car7", I checked out the beta location of Manana and found that it's just a sidewalk in final game. Since parking a car over the sidewalk is awkward, I can assume that there was a parking space that was meant to be located there, which was moved to the front of a shop, located on further west of the police station, in the final version and has Perennial parked on it instead of Manana. To be honest, none of those textures resemble Alpha/Beta III textures. 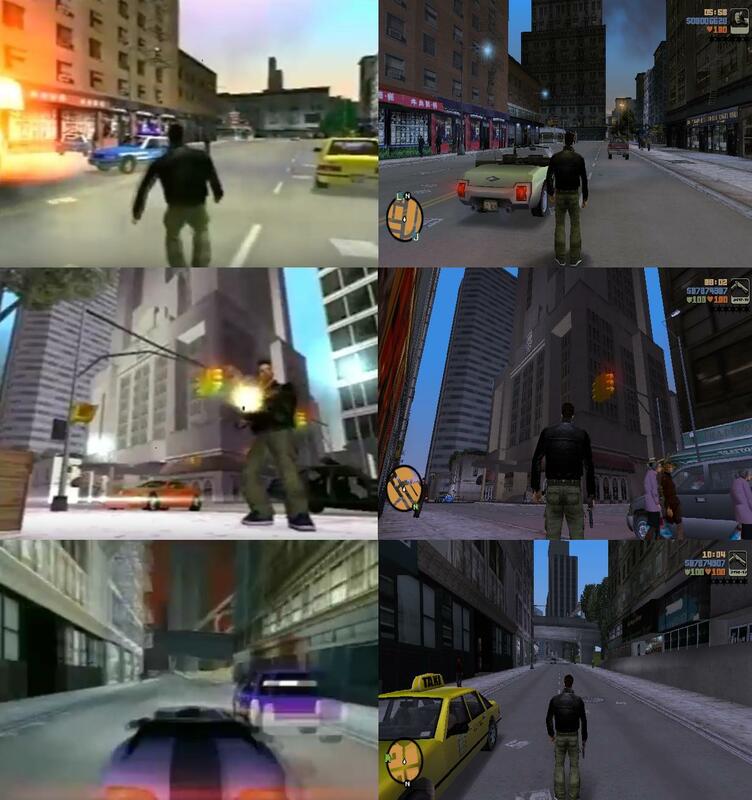 The alpha building texture style was resembling GTA2, rather than anything else. A few GTA2 textures were actually being used in alpha, as seen in some pictures and renders. But goddamn, at least III didn't have that f*cking ugly red sky. I'm not sure what kind of topic this is, if it is a request or just info. Maby both. For some reason, i'm always interested in the smallest graphic details, blur effects in games such as Midnight Club 3 or Burnout 3, and yeah. Let's get back to GTA III. 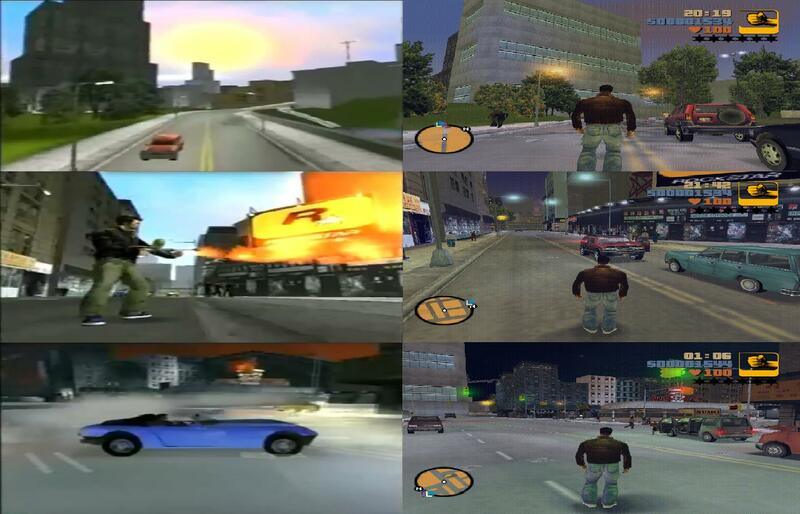 Now, the GTA III beta had alot of graphical changes, but i'm not focusing on the cartoonish version, but more to the pre-relaese version. Light Particle effects, (idk what to call it) were changed. The first one looks exactly like the particle effect in LCS. And another thing, the particle lights were too long and big, i like that kind of effect. And the last one, a purplelish sky. Night time also looked different, but more realistic. My question is, is it possible to get these graphical features in-game? And with the particle effects i don't mean the final ones, but the really long big ones in the pre-9/11 screens. Is it possible? Thanks. Nope, LCS has real time reflections. Buggy attempt at real time reflections if you'd ask me. An early attempt from R* Vision for have real time reflections in III. Also that screenshot looks like they are in some beta stage of the game, but they attempted to include real time reflections in the game or else only for the screenshot (probably?...) or is the particle.txd broken?. I've ripped some textures from the pcsx2, that looks like beta content in my opinion. What did you think, guys? for that BBC TV film on the GTA series starring Daniel Radcliffe? Unlikely to be an actual asset from Rockstar, given how they've had no (official) involvement in the creation of this TV film, but it still looks pretty convincing, hah. Too poor quality, can't really make jack sh*t out. Doesn't look like R* assets. So is it possible to get some of these features in-game? And i know the real-time reflections are almost not really possible to mimic the ones from the screenies (they look ugly anyways) and i want the big long particle rear and front lights effect. I know someone made a mod about that, but like really long, and even if you look at the car sideways, youll still see the particle effect. Is it possible? These exhibitions showed up atleast since 2005 so they re-written the old ones. Has anyone found this before? This, to me, confirms heli's and a assortment of planes were removed.